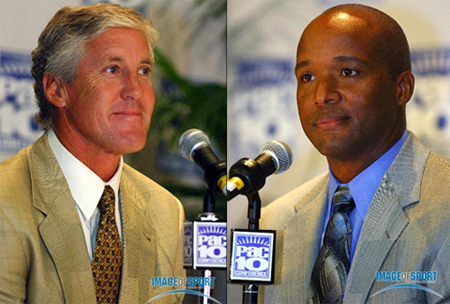 USC's Pete Carroll, left, might not be headed to the NFL anytime soon, but members of his staff might be. The Santa Rosa Press-Democrat is reporting that assistant head coach and quarterbacks coach Steve Sarkisian, 32, is on the verge of being named coach of the Oakland Raiders. And Sarkisian might be taking offensive coordinator Lane Kiffin with him. At rival UCLA, Jim Svoboda is out as offensive coordinator, meaning coach Karl Dorrell, right, is looking for his fourth offensive coordinator in less than five years. Dorrell is talking about taking on the duties himself, but there is speculation that Tom Cable, who left as the Bruins' offensive coordinator a year ago to take a job with the Atlanta Falcons, might be in line to return. Cable is looking for work after the Falcons fired Jim Mora and his staff. ... We thank Image of Sport for the photos.